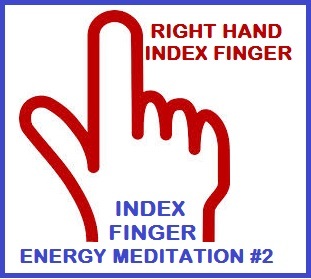 The index finger is associated with the heart chakra, the large intestine, and the meridian of the stomach. Author Gertrud Hirschi, in her book, Mudras Yoga in Your Hands, points out we can draw on our innermost intuition and receive inspiration. When doing the following meditation several days in a row, notice that there is a certain habit of thoughts. If we continuously replace harmful thoughts with useful ones, this can change the circumstances of life accordingly. 1. Sit or lie down. Encircle your right index finger with the four fingers of your left hand. Let the left thumb rest along the exterior of the right hand. Close your eyes. 2. 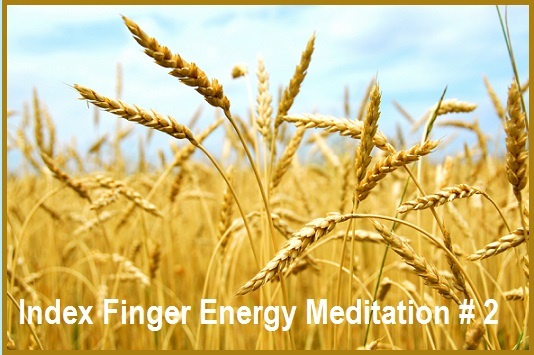 Visualize sitting in front of a field and observe the swaying grain. When you inhale, the ears of grain move toward you. When you exhale, they move away. Sometimes you see the entire field and sometimes you see individual ears of grain. Notice that when you inhale the space gets smaller, and larger when you exhale. The yellow ears of seeds indicate new beginnings. 3. Look into the expanse of blue clouded sky and then inwardly to the safety of your heart. Observe the thoughts that come and go. 4. How do you think most of the time? Is it a positive, negative, confident, fearful, brooding, critical, memory-dominated, or future-oriented way? Keep holding onto your finger for a while and feel the flowing warmth. Remember to encircle your left index finger with the four fingers on the right hand and hold this finger for a while.